If you have ever lived in a yard or neighbourhood full of mosquitoes, you will know how annoying their songs can be at night. And they don’t just sing – they bite too. And what's really bad about these guys? They come at night - when you are supposed to rest - sleep well - because it's always so calm at night. What if you could kill thousands of mosquitoes in one night? That’s right, thousands in one night. We are used to mice traps - for most of the village hunters - and all kinds of traps used to catch pests and rodents. But using traps on insects has not always been the case. Well we are used to the conventional way of killing them using sprays. But some sprays don't even do the job well and you might be forced to stay outside for the concentration to reduce before you can relax in your room which can be very annoying at times - especially on days when you are very tired. How about using traps on them? Today, we will look at a method of trapping and killing hundreds - even thousands - of mosquitoes using a mosquito trap made by Dan Rojas. Dan Rojas on a Youtube video shows how he catches thousands and hundreds of mosquitoes in one night using his dog as bait. Dan made the mosquito trap using a fan and a net - two things you can easily get. To set up the fan as a trap, he uses magnets to hold a net tightly over the back of the fan. Dan uses a Maxx Air 24 inch fan. Mosquitoes are attracted to carbon dioxide. That is why they always find their way to us at night: because we exhale carbon dioxide. You can also use Seltzer water (also known as club soda or soda water). An open bottle of Seltzer water will release carbon dioxide for about three to four hours. 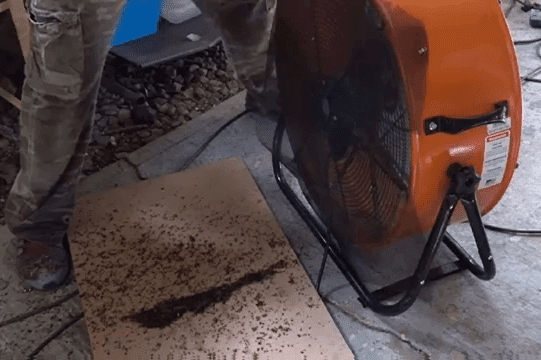 The C02 released attracts the mosquitoes which get trapped by the fan. Here’s how the trap works. It’s very simple. Fans pull air at the back but send them out at the front. Mosquitoes are very light and are easily pulled to the back of the fan but because there is a net over the back, the just get trapped. The fan does not kill the trapped mosquitoes so Dan sprays rubbing alcohol on them to kill them before removing the net – full of mosquitoes – from the back of the fan. When the fan is used outdoors, a mesh screen is used to protect it from pollutants that could get into it and damage it. This is a nice way of killing and getting rid of the malaria causing organisms called mosquitoes. And for the mosquitoes in my yard, it's payback time.